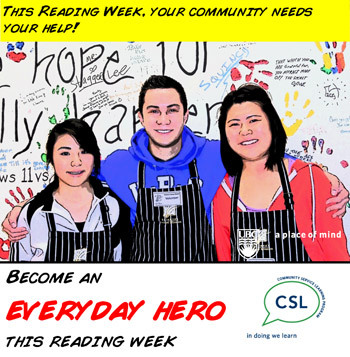 This Reading Week, the greater community needs the help of as many students as possible. The Community Service Learning Program has organized a series of one-day volunteer opportunities for interested students from February 18 to 22. Participating students will have the opportunity to make an impact in the community, meet new people, challenge themselves build their résumé and make a positive impact. 50 spots are available and the deadline to register is Friday, Feb. 1. To find out more, visit the Community Service Learning Program website or contact Program Coordinator Lori Field at 250-807-8665.